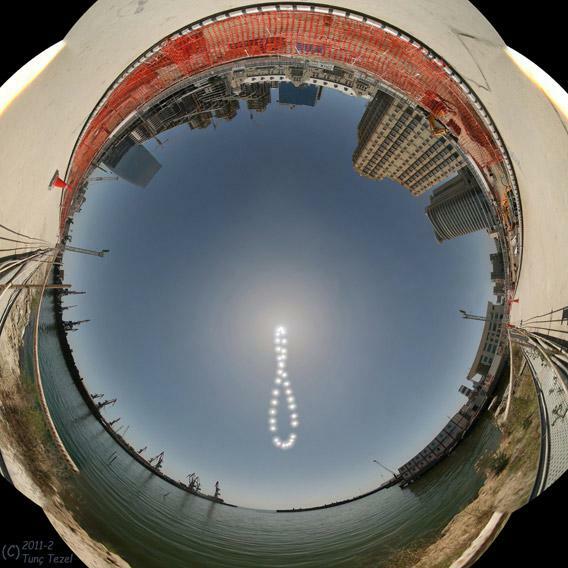 Analemma: The position of the Sun in the sky changing over a year. The motion of the Sun in the sky is complicated. Sure, you might think it’s simple: it rises in the east, gets up high in the sky, and sets in the west. That’s kinda sorta true overall, but if you pay closer attention you’ll notice that that’s only mostly true. It rises earlier every day until the summer, then starts rising later. It gets higher in the summer, and doesn’t rise exactly due east†. And it gets to its highest point in the sky at a different time each day. The Sun’s figure-8 annual motion in the sky: the analemma. Click to ensolernate. Photo by Tunc Tezel, used by permission. Surprise! I bet you weren’t expecting that! This figure-8 shape is called an analemma, and it may look familiar to you; it’s sometimes printed in atlases and Earth globes. Tunc went out every day at 12:40 local time (13:40 summer time, to compensate for humans artificially changing our clocks) in Baku, Azerbaijan, on the shores of the Caspian Sea. He then took several pictures using a wide-angle lens, combining them into a mosaic for each day. After a year, he took all the mosaics and combined them showing this 360° view of the ground, and the analemma in the sky. Tunc also put together an animation showing each image one at a time, and it’s fun to watch; you can see how a few cloudy days affect the shot, and watch as construction in Baku changes the landscape, too. So what causes this weird solar motion? The fault lies not in the stars, but in the Earth. There is a great website called, surprisingly, analemma.com, which has explanations of all this in detail. But let me give you the overview. The Earths orbital axis is tilted with respect to its orbit. Note: not to scale! The Sun is over 100 times the size of the Earth, for example. If the Earth orbited the Sun in a perfect circle, and the Earth’s axis weren’t tilted (in other words, the Earth’s axis were straight up-and-down, at a 90° angle to the plane of its orbit), the Sun would still rise and set, but it would take the same path across the sky at the same time, every day, all year. If you went outside at noon in January, and noon in June, the Sun would be in the same place. It would also rise due east, and set due west, always at the same time, every day. But this isn’t the case. 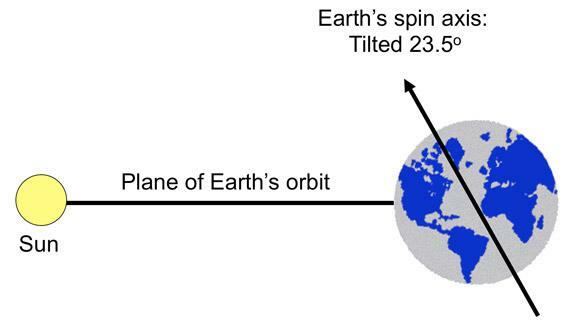 The Earth’s orbit is slightly elliptical, and the Earth’s axis is tilted by roughly 23.5° to the orbit. These two factors combine to make the analemma. In principle, it’s not too hard to understand. First, let’s look at the Earth’s tilt. On the summer solstice, the Earth’s north pole is tipped toward the Sun. In the northern hemisphere, this means the Sun gets high in the sky at noon. But in the winter, when the Earth is on the other side of its orbit, the Earth’s north pole is tipped away from the Sun, so at noon the Sun doesn’t get as high. The difference between highest and lowest point in the sky at noon is twice the Earth’s tilt, or roughly 47°. If at noon on June 22 the Sun were straight over your head, six months later at noon it would be 47° from overhead, or 90° - 47° = 43° above the horizon*. The Earth orbits the Sun on an ellipse. The scale here is greatly exaggerated for clarity. So if you measure the Sun’s height above the southern horizon every day at the same time, that height changes. In summer it’s high, in winter it’s low. And that’s why the analemma is extended in the north-south direction. Now let’s look at the orbit being an ellipse. That means that sometimes (in January) we’re a bit closer to the Sun, and sometimes (in July) we’re farther away. When the Earth is closer to the Sun, it orbits faster, and when it’s farther, it orbits more slowly. Imagine for a second the Earth didn’t spin on its axis. If that were the case, it would take the Sun an entire year to go around the sky once, and our day would be as long as a year. But, in January the Sun would move across the sky a little faster, and in July it would move a little slower, reflecting the change in the Earth’s speed around the Sun. But the Earth does spin, at a constant rate. We see the Sun rise in the east and set in the west once every 24 hours or so. But that east-to-west motion is not constant during the year due to our elliptical orbit. Half the year the Sun is moving a bit more quickly to the west, and half the year it’s moving more slowly. So if you go outside at the same time every day and take a picture of the Sun, you’ll see it drift to the west half the year, and to the east the other half. And that’s why the analemma is extended in the east-west direction. The Earth’s axial tilt moves the Sun north/south over the year, and the elliptical orbit moves it east/west. Combine the two, and you get that crazy figure-8 in the sky. 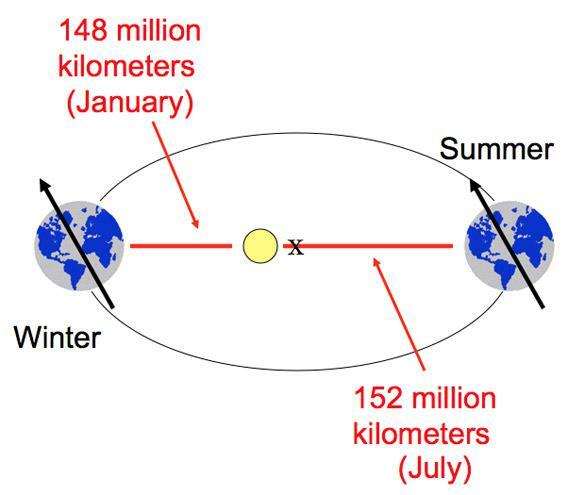 There are details that confuse this, too, like the fact that the two motions aren’t aligned; the axial tilt contribution is maximized on the solstices, but the elliptical orbit contribution is at a maximum in April and July (near the equinoctes, coincidentally—that’s the correct plural of equinox, by the way). That skews the analemma a bit, making the two loops different sizes. Not only that, but other planets have analemmae, too! Those shapes depend on their own axial tilts and ellipticities, so the shapes vary quite a bit. It’s interesting to see how tings change planet to planet. I find the analemma fascinating, and not just because of the science. It’s an amazing reminder that we take a lot of things we see every day for granted, and miss a lot of the cool details when we focus on the here-and-now. The entire Universe is wheeling and careening around over our heads and beneath our feet. If we don’t pay attention, we’ll miss all the fun. †Correction (Apr. 29, 15:00 UTC): Arg! I originally typed “west” when I meant “east”. The Sun rises in the east, only rising due east on the equinoctes, I’ll note. Sorry about the confusion. *Correction (Apr. 29, 14:00 UTC): Originally, I inadvertently wrote that six months after being overhead, the Sun would be 43° from overhead, when I meant it would be 47° from overhead. This has been fixed in the text.